Where did you get this dog? Any info on prior history? Medical Information Does your dog have allergies? Is your dog on monthly flea/tick program? Special medical instructions/restrictions? Feeding Schedule Brand/Type of Food Allowed to have treats? Does your dog growl or become aggressive around food/treats/toys? What other pets do you have? 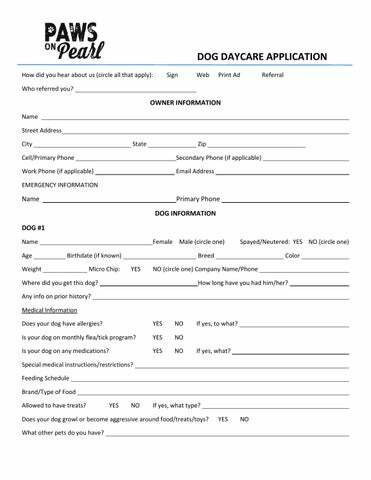 DOG DAYCARE APPLICATION How do your dog interact with other dogs and/or children in the home? How does your dog react to visitors in the home? Does your dog has specific fears of certain people, things, etc. (certain types of other dogs, gender of people, clothing, hats, etc.)? Has your dog ever growled, snapped or bitten a person or another dog? Please explain. What other exercise does your dog receive (walking, etc.)? Is your dog housebroken or crate trained? Has your dog ever been to daycare before? Has your dog received any formal training? Does your dog have any of the following issues? Does your dog growl or become aggressive around food/treats/toys? What other pets do you have? How do your dog interact with other dogs and/or children in the home? DOG DAYCARE APPLICATION DOG CARE AGREEMENT I understand that Paws on Pearl, LLC has relied upon my representation that my dog is in good health and has not injured or shown aggression or threatening behavior to any person or dog in admitting my dog for services at their facility. I further understand that Paws on Pearl, LLC, their owners, staff, partners and volunteers will not be held liable, financially or otherwise, for injuries to my dog, myself or my property while my dog is participating in services provided by Paws on Pearl, LLC . I hereby release Paws on Pearl, LLC of any liability of any kind arising from my dog’s participation in any and all services provided by Paws on Pearl, LLC. I further understand and agree that any problems with my dog, behavioral, medical or otherwise will be treated as deemed best by staff of Paws on Pearl, LLC in their sole discretion and in what they view as in the best interest of the animal. I understand that I assume full financial responsibility and all liability for any and all expenses involved in regards to the behavior and health of my dog. I further understand that there are risks and benefits associated with group socialization of dogs. I agree that the benefits outweigh the risks and that I accept the risk. I desire a socialized environment for my dog while attending services provided by Paws on Pearl, LLC and while in their care. I understand that while the socialization and play is closely and carefully monitored by Paws on Pearl LLC staff to prevent injury, it is still possible that during the course of normal play that my dog may receive minor nicks and scratches from roughhousing with other dogs. Any injuries to my dog will be pointed out by staff upon pick-up. I understand that by allowing my dog to participate in services offered by Paws on Pearl, LLC I hereby agree to allow Paws on Pearl, LLC to take photographs and/or use images of my pet in print or digital form or otherwise for publication and/or promotion. I further understand that I am solely responsible, financially or otherwise, for any harm or damage caused by my dog while my dog is attending any services provided by Paws on Pearl, LLC. Payment is required when services are rendered. If Paws on Pearl pursues collection proceedings, I will pay reasonable attorney’s fees and costs of collection above and beyond the debt owed.